The abdominal wall is made up of layers of different muscles and tissues. Weak spots may develop in these layers to allow contents the abdominal cavity to protrude or herniate. The most common abdominal hernias are in the groin (inguinal hernias), in the diaphragm (hiatal hernias), and the belly button (umbilicus). Hernias may be present at birth (congenital), or they may develop at any time thereafter (acquired). pushed through a defect, weakness, or entry/exit sites of structures that normally pass through in the abdominal wall (for example, the femoral canal or the closed pathway where the testicles descended during fetal development). Abdominal hernias can occur in men, women, and children at any age, but most occur in middle-aged and elderly men. They are diagnosed by feeling the bulge in the abdomen. The type of hernia depends on where it occurs (inguinal, femoral, umbilical, and others). Any condition that increases pressure on the abdominal cavity may cause a hernia (for example, coughing, heavy lifting, straining during a bowel movement, obesity). Although some hernias are painless, many are not and may lead to nausea and vomiting. Some hernias can be reduced (pushed back into the cavity) others may not (incarcerated hernias). 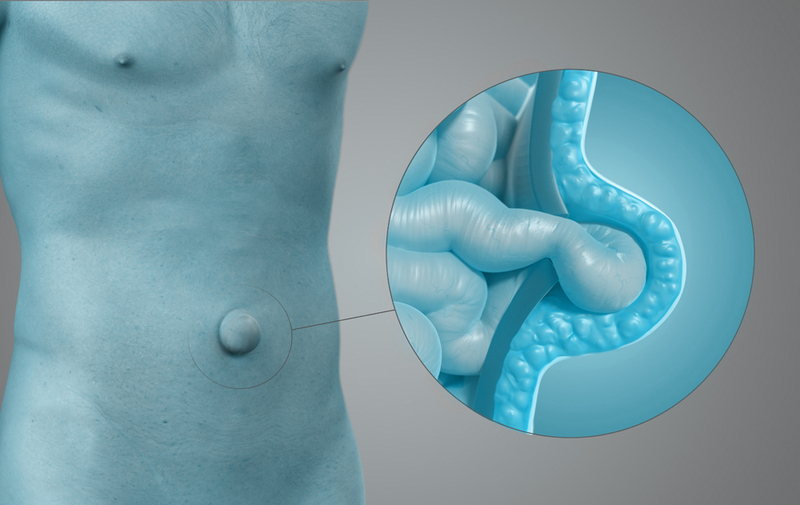 If the opening of the incarcerated hernia is so tight that it cuts off the blood supply to the intestine segment that forms the bulge, the hernia is termed strangulated and is a medical emergency; however, any irreducible hernia needs medical evaluation. Surgical repair is indicated for most hernias that require treatment. All irreducible hernias need immediate evaluation because of the possibility of becoming strangulated. 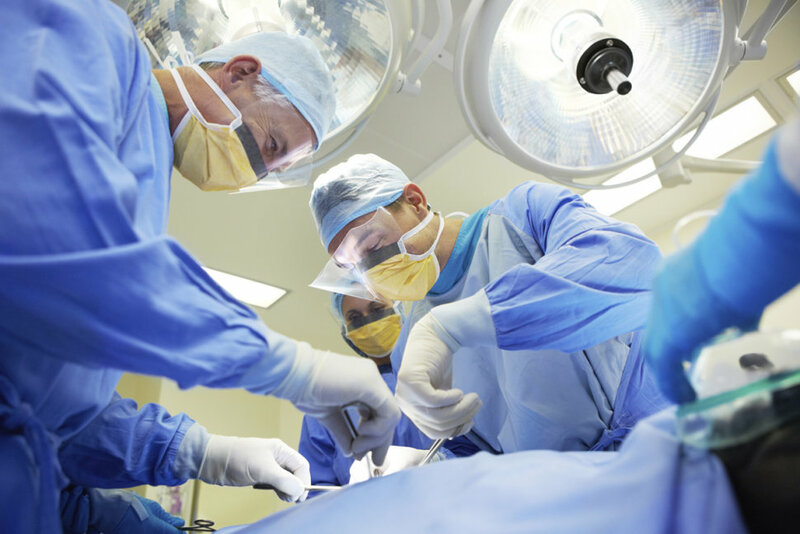 In some situations, surgery may be delayed or unable to be performed. Your doctor may prescribe trusses or belts to help keep the hernia reduced. People with hernias and those that have had surgical repair of hernias should avoid heavy lifting and other activities that cause high intra-abdominal pressure. Inguinal hernia surgery refers to a surgical operation for the correction of an inguinal hernia. Surgery is not generally advised in most cases if the hernia produces no symptoms; watchful waiting being the recommended option. In particular, elective surgery is no longer recommended for the treatment of minimally symptomatic hernias due to the significant risk (10%) of chronic pain (Post herniorraphy pain syndrome) and the low risk of incarceration (ca. per year). However, considering that the “elective (inguinal) hernia surgery offers value-for-money” and the “symptoms will likely progress and an operation will be needed eventually”, “surgery might be superior to “watchful waiting””. As general advice in surgery, the choice of the surgeon and hospital are more important than the choice of a particular surgical technique or material. High-volume hospitals and surgeons have better outcomes. In particular for inguinal hernias, surgeons with more than 200 interventions per year are preferable. Regarding the surgical technique for inguinal hernias, laparoscopic is better than open repair. Anyway, an expert surgeon in open surgery is preferable to a non-expert one in laparoscopic surgery. In particular, “recurrence rates with laparoscopic inguinal hernia repair are highly operator dependent”. The learning curve for laparoscopic techniques has been estimated to be 50-100 interventions. However, at least the totally extra-peritoneal (TEP) hernia repair is safe when performed by supervised senior surgical trainees.